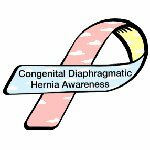 Congenital diaphragmatic hernia (CDH) occurs when the diaphragm fails to completely close during development. As a result, abdominal organs enter the chest cavity and prevent lung growth. About 50% newborns diagnosed with CDH die of two major complications: incomplete development of the lungs (pulmonary hypoplasia) and pulmonary hypertension (high blood pressure in pulmonary blood vessels). CDH is as common as spina bifida (split spine) and cystic fibrosis (mucoviscidosis), it occurs in 1 in every 2500 babies. However, very little research is being done, and the cause of the condition is still unknown. Very people known about or are aware of CDH, and CDH Awareness Day was created to disseminate information about this congenital effect. CDH Action Day events and activities include (but are not limited to) awareness events, fundraisers, educational campaigns, parades, etc. On April 19, people are encouraged to wear the pink, blue and yellow CDH Awareness Ribbon, donate, and volunteer to help raise awareness and take action.